P0992. 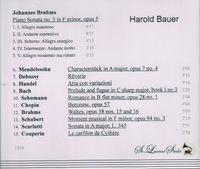 HAROLD BAUER: Bach, Scarlatti, Couperin, Handel, Schumann, Schubert, Mendelssohn, Chopin, Debussy & Brahms (the latter’s Sonata #3 in f). (Canada) St Laurent Studio YSL 78-042, recorded 1939, Schirmer. Transfers by Yves St Laurent.